My ears were itchy when I returned from Ecuador. I was a bit anxious about having caught something awful. In stretching my mind, I wondered if I had picked up something on that 3-day tour out of Quito. That tour involved riding in a van around in the Highlands, a mountainous area. The locals, dressed in bright solid colors, farmed on the mountain slopes. Some women used handlooms to spin while watching over sheep. 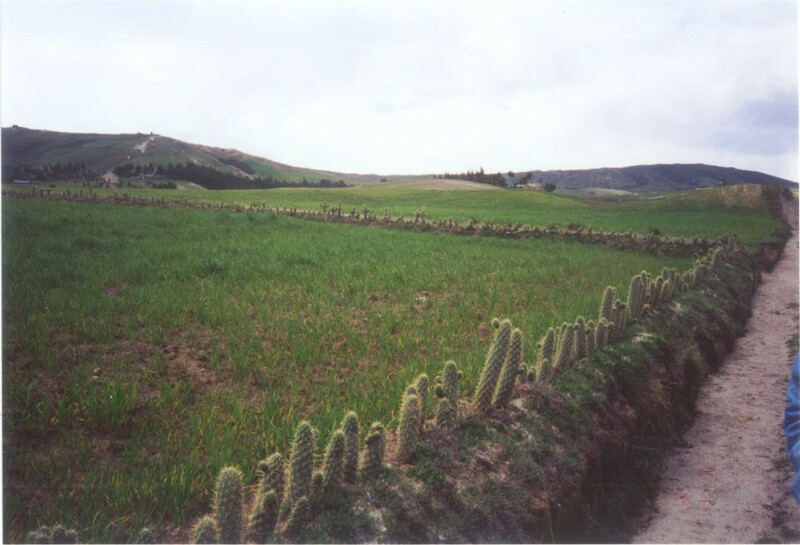 The cactus “fencing” separating fields of crops and stopping wandering cows seemed so logical, but I had never seen cactus fencing before. The plan was to have a picnic by a lake that was set in a crater. We walked about the lake in lovely summer weather, but then the wind grew fierce so we moved on to look for a less treacherous place to open our box lunches. We stopped at a small village with a population estimated at 50. That was at an elevation of 13,000 feet above sea level. It was good to get out of the van, but much too windy to consider a game at the local volleyball nets. The summer warmth had blown away; it was so cold that one man invited us to have our lunches in his house. We went in and climbed a ladder to a second floor loft. There was no furniture, but I noted a few colorful masks, the sorts on sale at tourist shops in Quito. I ate my lunch while contemplating a bright blue mask with pointed animal ears. In the less than bright loft, that mask seemed eerie. I asked and the host showed me to the outhouse; it was a deep ravine full of refuse. Still a bit unsettled by the mask, I climbed down the ravine a ways for privacy and then, of course, I had to climb over the refuse on my way back up. We moved on. I didn’t give the mask another thought until a month later when I got home and my ears were intensely itchy. That was a new malady for me, and I started wondering about the ravine and that led to my recalling the mask. It was at that point, I started getting travel vaccinations and taking any recommended medicines for specific destinations. If nothing else, it contributes toward my peace of mind.